Great pay, great benefits and fascinating work. All of these can be found with a career as a United States Secret Service agent. The Secret Service is the premier protective services agency, providing security services and dignitary protection to the President and Vice President of the United States as well high-ranking foreign visitors, from prime ministers to Popes. While probably best known for their vital role in protecting the leader of the free world, Secret Service agents play a huge part in ensuring the integrity of the nation's financial infrastructure. Formerly part of the U.S. Treasury Department before their transfer to the Department of Homeland Security, the U.S. Secret Service investigates financial crimes, securities fraud and, perhaps most famously, counterfeit currency. With such interesting and important dual roles in the law enforcement community, it's little wonder that secret service careers would be a popular choice for those of you looking for work in law enforcement. 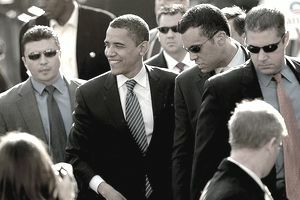 If you're interested in this exciting career, you'll want to know how to become a secret service agent. Remember, that's just to get your application looked at. The U.S. Secret Service is highly competitive, and to make it through the hiring process and into the Academy, you'll need to be the best possible candidate you can be. If you meet the minimum qualifications, then your next step is to make sure you have the credentials and qualities to compete. To move forward in the hiring process, you'll need to hold at least a bachelor's degree from an accredited university and demonstrate "superior academic achievement." The Secret Service expects you to have earned a GPA of 3.0 or higher, graduated in the top third of your class, or have been a member of a national academic honors society. If your undergraduate years weren't the brightest time of your academic career, you can still qualify with at least 18 months of graduate coursework, a master's degree, or prior work experience relevant to the job you're applying for. Relevant experience for an aspiring secret service agent can include working as a detective or investigator or other jobs in which duties involved similar investigative and law enforcement work. If you have the credentials and qualifications the Secret Service is looking for; the next step is to take a series of tests to see if you have what it takes to get the job done. The first test is the Treasury Enforcement Agent Exam. It is a basic abilities test that measures reading comprehension, reasoning, mathematical skills and investigative abilities. You'll also participate in a report writing assessment to measure your writing skills. In addition to the written exams and assessments, you need to prepare yourself for a series of oral interviews designed to assess your verbal communication skills and your ability and desire to succeed in your career. All law enforcement careers can be physically demanding, but the rigors associated with dignitary protection in particular demand that Secret Service agents are in excellent shape. If your goal is to become a Secret Service agent, you need to prepare for a physical fitness evaluation and work your hardest to get in top physical condition. The Secret Service physical fitness test consists of push-ups, sit-ups, chin-ups and a 1.5-mile run. You'll be scored based on the number of push-ups, sit-ups, and chin-ups you can knockout and how fast you're able to complete the run. It's never too early to start training for the physical fitness test, so if this is a career you're serious about pursuing, check with your doctor and get started on a fitness routine that involves cardiovascular exercises, running and weight training. The people responsible for protecting the president must be of impeccable character and able to qualify for a top-secret clearance. To make sure you're the best person for the job, you'll undergo a thorough and extensive background check. The Secret Service background investigation includes a criminal history check, credit and financial status check, work history verification, and past employer interviews. If you have past-due debts, student loan defaults, prior felony arrests or past drug use, you may be disqualified from the employment process. Part of the background check will include a polygraph exam. During the polygraph, the most important thing to remember is, to be honest. If the polygraph examiner detects deception, you can be assured you won't get the job. That's not a guarantee that honesty will get you hired, but dishonesty won't be tolerated. To make sure you're healthy enough for the job, the Secret Service will put you through a physical examination. Doctors will check your vision and your hearing, as well as your blood pressure and heart, among other things. The purpose is to avoid hiring someone that may be at-risk of getting hurt or worse on the job due to poor health. If everything checks out, you'll be one step closer to the Academy. If, after the lengthy hiring process, the Secret Service decides you're just the kind of person they're looking for, you'll be sent to the Academy. Secret Service agents undergo an extensive training process, beginning with 17 weeks of special agent training at the Federal Law Enforcement Training Center in Glynco, Georgia. After special agent training, recruit agents are sent to the Secret Service's James J. Rowley Training Center outside of Washington, D.C. Here, you'll be pushed physically and mentally as you prepare for the specific duties associated with working as a Secret Service Agent. It takes a lot of hard work and dedication to prepare yourself for a career as a Secret Service agent, but the rewards are well worth it if you can stick it out. Special agents may be called to work anywhere in the world, either providing protection to dignitaries or investigating financial crimes. As with most other special agent careers, the U.S. Secret Service offers very competitive pay, great health insurance benefits and, when it's time to hang it all up, excellent retirement benefits. If you're willing to put in the work required to become a Secret Service agent, you may soon find out that it's the perfect criminology career for you.